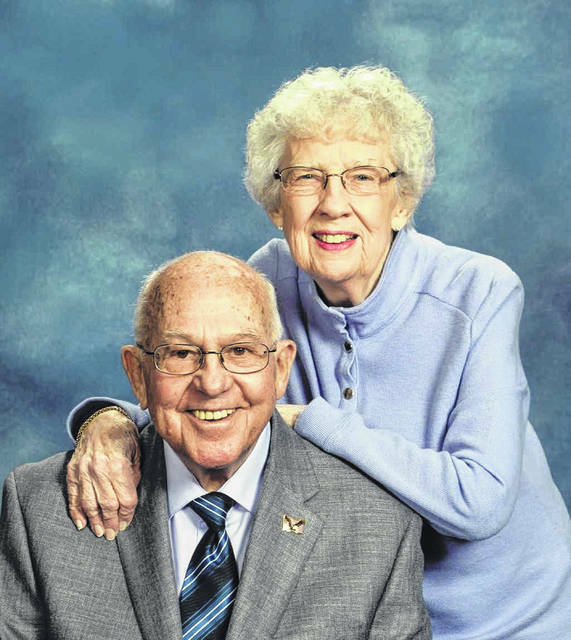 Harold and Betty Walker recently celebrated their 65th wedding anniversary. They were married November 15, 1953 in Gallipolis, Ohio by Rev. Paul Niswander at the home of Betty’s sister and brother-in-law, Ethel and Clyde Bradbury. The Walkers have two daughters, Paula (David) Clay and Letty (Matthew) Willis, all of Gallipolis, Ohio. They have four grandchildren, Kelsey (Brandon) Mitchem of Bidwell, Ohio; Garrison (Lindsey) Salisbury of Crown City, Ohio; Brianne Willis of Ashland, Kentucky; and Brooke (Samuel) Frazier of Ashland, Kentucky. The couple has four great grandchildren, Kylee, Reese, and Caleb Mitchem of Bidwell, Ohio and Garrin Salisbury of Crown City, Ohio. Harold served in the United States Navy during the Korean Conflict. In December 1996, Harold retired from the University of Rio Grande and Betty retired from Evans Enterprises, Inc. After retirement, they traveled but now enjoy spending time with their family. They are members of and attend First Baptist Church, Gallipolis, Ohio.